Imagine yourself sitting in a small meeting. Everyone appears to be engaged and responsive to the subject. Enough coffee has flowed that the group is awake and alert. Then that point in the meeting happens. Issues are raised about problems and obstacles facing the team, departments or the company. Suddenly the conversation shifts to group insights and inspiration. The auto reply kicks in from the team. Old ideas with new names are thrown out on to the proverbial strategy table. Buzzwords fly like swarms of pesky bugs on a Summer’s evening. Unfortunately, there is no great solution generated, why? What is so challenging for such intelligent business folks that a single strong solution can not be developed or worse yet, acted upon? Let me try to sum up the condition at hand. I heard this quote once upon a time and it has stuck with me throughout all my conversations with teams, no matter the organization, business or stage of development. 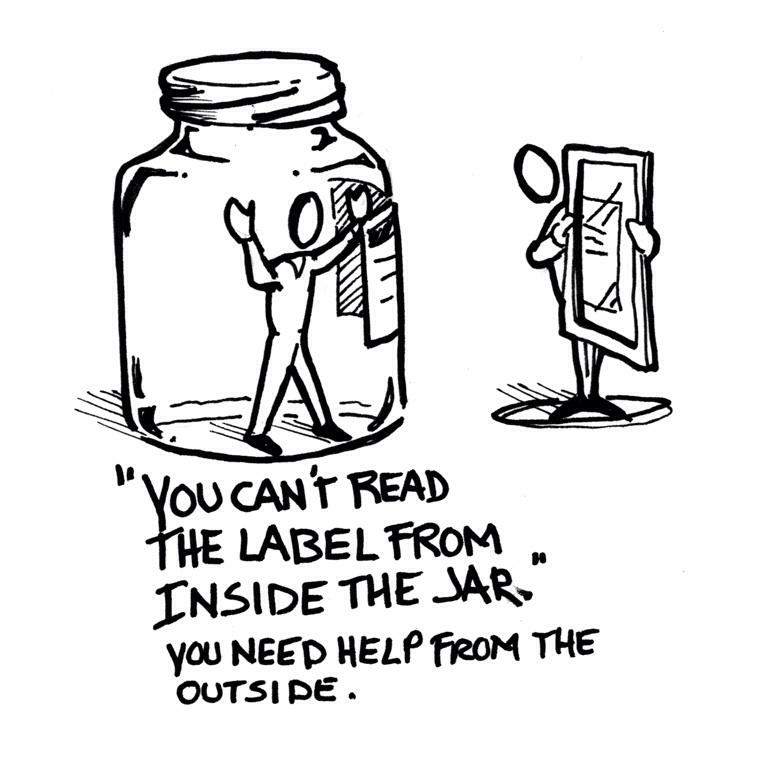 “You can’t read the label from inside the jar.” Old southern saying. This is the simple fact. You’re too close to the problem or you are the problem and the only way to see a clear path is to bring in someone from the outside who can see your situation for what it is and what it could be. Utilize others who do not have any equity in the situation to help guide you through the forest of familiarity. Hire a guide to ask the questions you don’t know to ask yourself or are afraid to ask. Seek outside help to better see inside.